Futurist Renaissance man, Thomas Piper Jr. debuts GET IT New energetic soulful single CREDITS: Thomas piper - Director, Cinematographer, Editor, Drone Operator, After Effects & Graphics Designer. Thomas Piper - Ableton Documentary interview of independent singer, producer, beat maker, videographer and blogger Thomas Piper to learn about his weekly Beat Design series. Thomas Piper Live @ Soul In The Horn witness revelers groove to "Get It'. Video directed and edited by the artist. A’capella version of God's Light Sunlight the new single by Thomas Piper, Jr. Filmed by the artist. Thomas Piper - "Requiem for a Sunny Day" Video edited and directed by the artist. Thomas Piper Is An Accomplished Vocalist, Sound Sculptor And Visual Artist Who Encompass A Wide Array Of Multimedia Processes To Highlight His Musical Artistry. Thomas Has Finessed The Art Of Uniquely Playing The Ableton Push By Facing The Controller Towards The Crowd, As He Exploits The Capabilities Of This Instrument As If Playing The Piano. He’s A Singer/Songwriter, Musician, Composer, Performer, Producer, And Visual Craftsman Who Combines These Elements To Realize His vision. Mr. Piper, taps into his Trindadian roots and draws inspiration from the world around him in his Brooklyn, NY home. 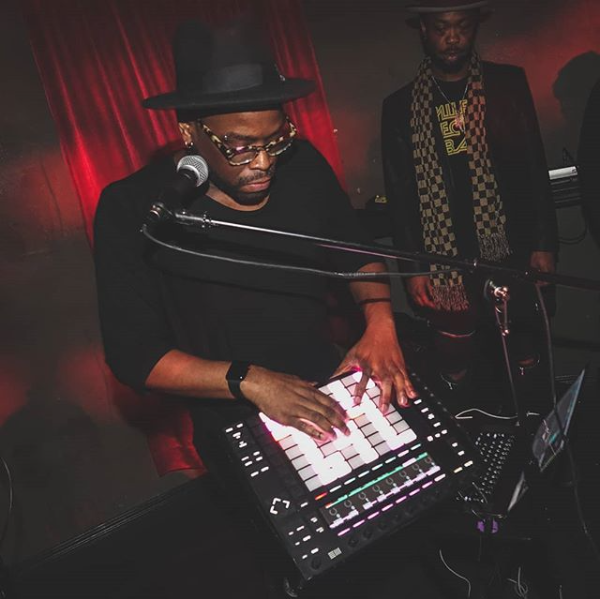 Along With Other Controllers, Live Instruments And His Smooth Vocals, He Fuses His Roots In Hip-Hop With Electronic And Soul Music; Blending A New Musical Genre. In Mastering The Push, Coupled With His Endearing Voicing And Vibrant Melodies, Thomas Has Innovated Its Use To Draw Sweet And Complex Cords Akin To A Jazz Pianist, Yet As Energetic As A Whaling Guitarist. On September 21, 2018, Thomas Released Get It, his new Single and video - his brainchild is an uplifting tale to chase of your dreams. It’s been featured on Apple’s beats 1 Radio - Q-tip’s Abstract Radio Episode 121. Currently, Thomas Is In His Studio completing His Debut LP (A) Permission To Live.?! ; a collection of modern soulful songs that Prompt his audience to take Agency of their lives. This record was inspired by watching his audience hesitate to engage with the show, though they wanted to Dance, Clap and freely express themselves. These songs culminate in records, that’s elevated by Thomas’ soulful baritone, which punctuates life’s journey with hope. Over the years, he's incubated his captivating performance and musical storytelling while performing throughout the U.S. Thomas Shaped all aspects of this project, including directing, shooting, editing and releasing videos for the album. This Multi-Skilled Musician Has Been a Featured Artist on Ableton’s Website Documentary Series - Thomas Piper: This Is My World; Push Performances: Five Of Our Favorites; And Create Digital Music Which Highlighted His Soulful Songs And Lively Stage Performance. Thomas Has Showcased At Aqua Art Miami, Webster Hall - NYC, Soul In the Horn - NYC, Tekserve, Make Music NYC, Maker Fair-NYC, SoFar San Francisco And Various Venues. He’s Written And Produced For Hank Shocklee, And Amel Larrieux, And several Artists On Gee Street Records. His Songs Were Featured In Films How To Be A Player, Great White Hype And An Over Simplification Of Her Beauty. Through The People’s Republic Of Sound, His Musical And Visual Production Company, Thomas Piper Hosts And Performs Live Beat-Making And Singing Sessions, On His YouTube Channel, Beat Design. Recently, He Sang, Wrote And Directed Let’s Move Your Body, A Jumping Jack Song For Sesame Street’s You Tube Channel - Sesame Studios. In Addition, He's An Accomplished Videographer And Director For Motema Records: Joey Alexander And Gregory Porter; Georgia Ann Muldrow and many Artists. Feel Free To Come To His Shows And Say ‘Hi’. Join The Republic And Enjoy The Journey. Now accepting bookings! To book Thomas Piper for an event, Concert or festival, please feel free to Contact us with your inquiries.